Whether you are for or against the legalization of marijuana—and I am not taking a position here— no one can dispute that driving a car after the use of marijuana is dangerous. Which means it’s even more dangerous to drive a big rig while under the influence of marijuana. How do you identify a stoned (truck) driver? A major problem for law enforcement is that there are few accurate roadside tools to detect marijuana impairment. Field sobriety tests are common, or simple observation techniques, have been developed to fight drunk driving. The problem is that these tests are not reliable for detecting other forms of impairment, and are easily challenged in court. In Washington State, a driver can be charged with Driving Under the Influence if they are found with a THC level of 5 nanograms per ml of blood. However, there remains a dispute as to how scientifically appropriate the limits are, as THC remains in the bloodstream long after it’s ingested. Other currently available tests, using saliva or urine can take many hours or several days for a result. A Breathalyzer for marijuana impairment? Recently, a California company claims it has developed a “pot breathalyzer”. This tool has not been perfected, but its development is a step in the right direction. 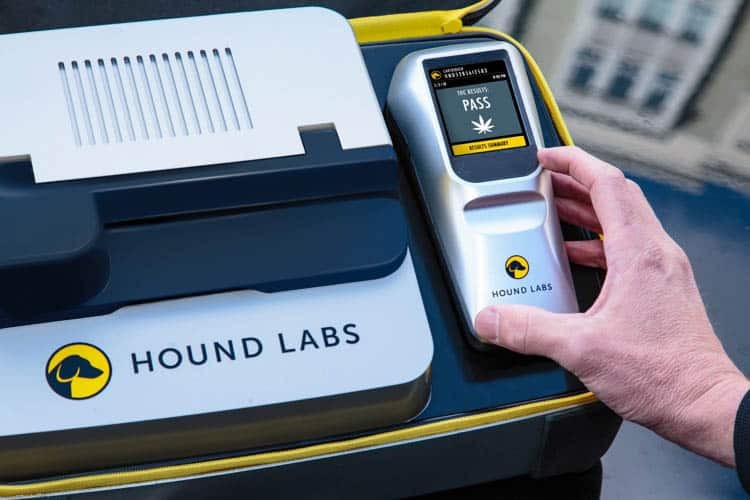 Hound Labs says their device can accurately detect whether a person has smoked marijuana in the last two hours. It detects the presence of THC in the subject’s breath. Theoretically, it could give law enforcement information about marijuana impairment in just a few minutes, instead of hours or days. HoundLabs says their device can tell if a driver has smoked pot in the last two hours. The test takes only minutes. The marijuana breathalyzer isn’t perfect. It can’t calculate the amount of THC consumed. And it seems to be dependent on the driver having smoked marijuana, although there are several other methods of ingestion. I don’t know if this new device will become the standard test for stoned driving. What I do know is that a stoned driver behind the wheel of a 60,000-pound vehicle can cause a lot of damage. Bus drivers and truck drivers are held to a higher standard. I suspect that the same will be true for the eventual, inevitable pot breathalyzer. We need all drivers to fear being caught driving stoned, and to know that there are true consequences for that dangerous behavior. It is past time for a clear and reliable test for measuring marijuana impairment. Since Washington, Oregon and Colorado legalized recreational marijuana, safety advocates have been looking for statistics on car crashes directly caused by marijuana-impaired drivers. Washington among legal marijuana states with an increase in car crash claims.